I love Mexican food and was very excited to hear about a very popular restaurant in Mexico city that had just opened in South Beach. So, I gathered a group of friends and dashed over to explore what all the fuss was about! Outside, a lovely lit sign that reads Porfirio’s Mexican Non Cliché caught me by surprise. Hmmm…what are they trying to say? That they don’t serve tacos or tamales? No Tex-Mex here? Intrigued, I walked into this modern eatery not knowing quite what to find. It looked a lot more like a hip Asian restaurant than your typical colorful south of the border joint. Wide spaces surrounded by beaufiful wood paneled walls keeping up with the trendy feel so common in South Beach. Our server, a young friendly Basque named Enrique, poured the perfect Gin Tonic that was mixed right in front of me, something unusual in the US. No, I did not have any tequila but I did try the Pierde Almas Mezcal, made from the Maguey plant, that has a slightly smokey and sweeter taste. Yet, as I looked through the menu, I could barely recognize any of the dishes as Mexican: Burger? 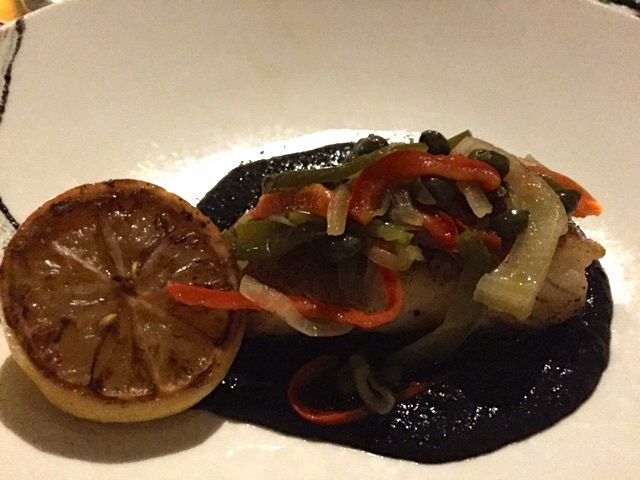 Black Alaskan cod in squid ink? Where are the tortas, the sopes, the enchiladas shown on the original menu?? The best dish of all was the tender and moist sea bass al Pastor( marinated with anatto and chargrilled). As far as the cod in squid ink for $39, very dry! 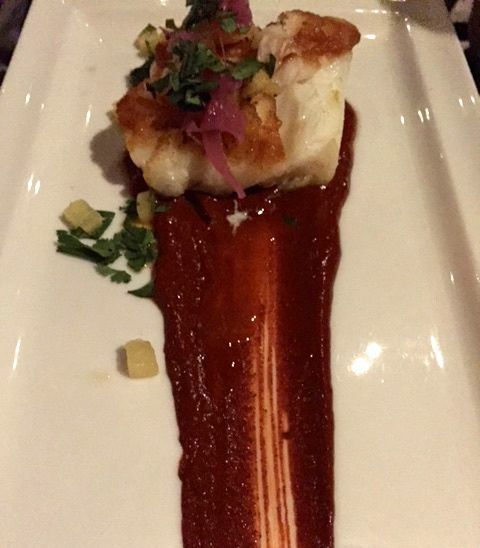 And the ink sauce was so salty it was almost impossible to eat as opposed to the huge shrimp Guajillo which was rather bland. Fortunately, desert was actually very nice. 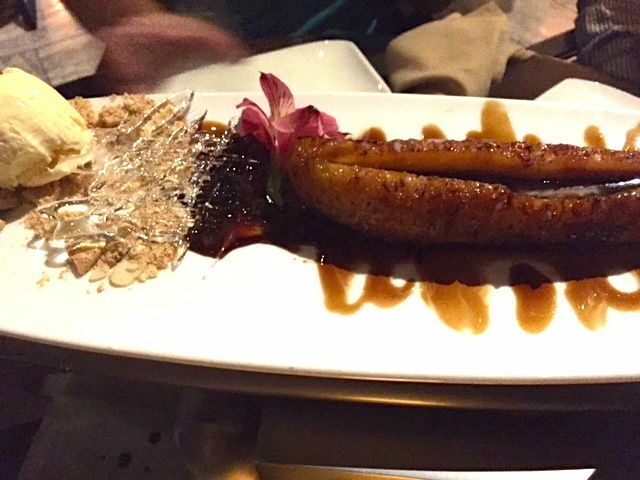 The baked bananas served with vanilla ice cream were quite the treat in a foster kind of way. The strawberries with meringue were light and tasty also. Whether non cliché or not, all in all, Porfirio’s was somewhat of a disappointment. Instead of trying to be like most of the other stuffy and overpriced Miami Beach restaurants, perhaps it should offer more of the authentic fare it serves back home. After all, everyone knows that Mexican cuisine is one of the best in the world! My first impression when I came for brunch was great. 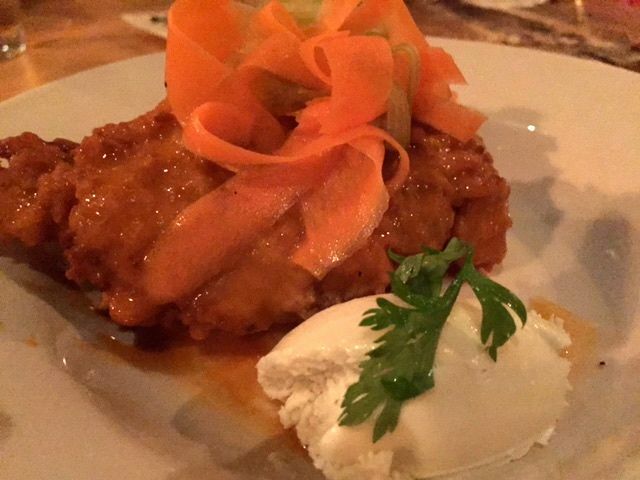 Everything about it: food, service and ambience. But when I came back for dinner, I was even more impressed. What makes a great restaurant? Ask the guys at the Federal! Nothing more inviting than good lighting and I don’t mean bright lighting. It’s an essential element in the ambience of a restaurant and while you don’t want to be squinting to read the menu by a tiny candle light, you don’t want to feel like your dining in a dental office either. Lovely outdoor string lights and indoor soft table ones invite you to explore one of the most exciting menus in Miami. This time, I had some friends visiting from Spain whom I did not want to disappoint. I didn’t want them to badmouth American cuisine as Europeans usually do ” oh you guys eat mostly burgers and fries! Blah, blah, blah….I had to prove them wrong which is exactly why I chose Southern. 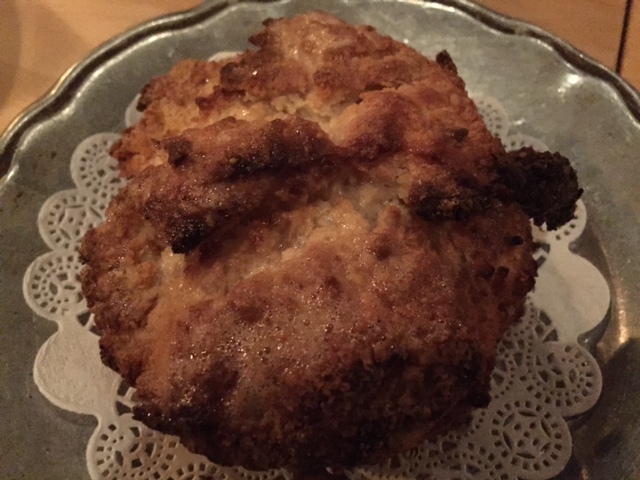 We started with the Federal classics: a Jumbo Buttermilk Biscuit glazed with apple honey and sea salt for $6.00, the amazing Jar O’duck made with duck confit rillette( a variation of pâté), charred marshmallow fluff and candied sweet potato for $12.00. This one was a real treat served with delicious homemade bread. The Buffalo Style Pig Wing for $7.00 was interesting: made of pork instead of chicken in a tangy sauce accompanied by a creamy blue cheese dressing…a little spicy for some but delicious nonetheless. That was just the beginning! We followed with the Surf and Turf Jambalaya for $22.00. According to the Paella connoisseurs at the table, it was outstanding! Chock full of gulf seafood, smoked chicken and Andouille sausage, this dish was an impressive southern treat for this group of Valencianos. 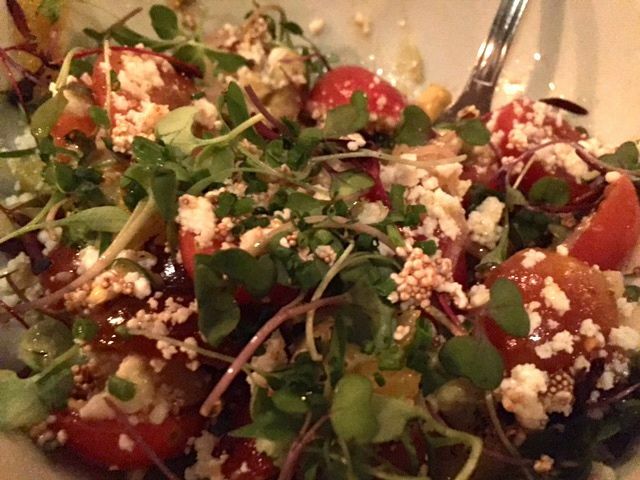 For a light touch, we added the Heirloom Florida Tomato Salad for $12.00. A lovely bowl of garden goodness: avocado, shallots, hearts of palm, puff amaranth and Harpke family farm sprouts sprinkled with a good dose of queso fresco. 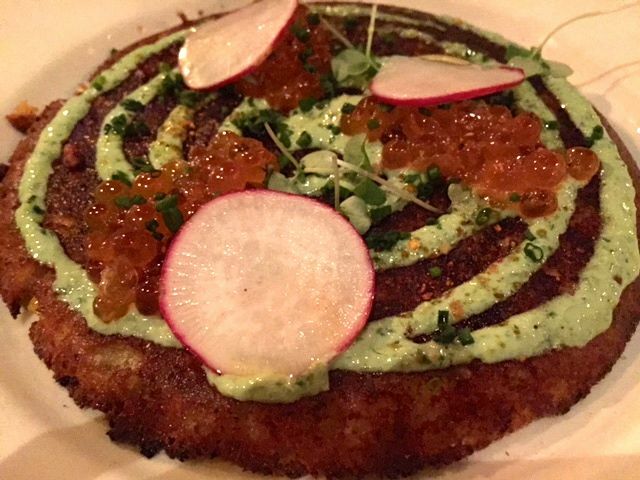 Along came some Country Corn Cakes dotted with plenty of salmon caviar, herb crème fraiche and lemon zest for $14.00. To top off this southern feast, we had to have desert. The Bourbon Bread Pudding made with Krispy cream doughnuts were pretty good. 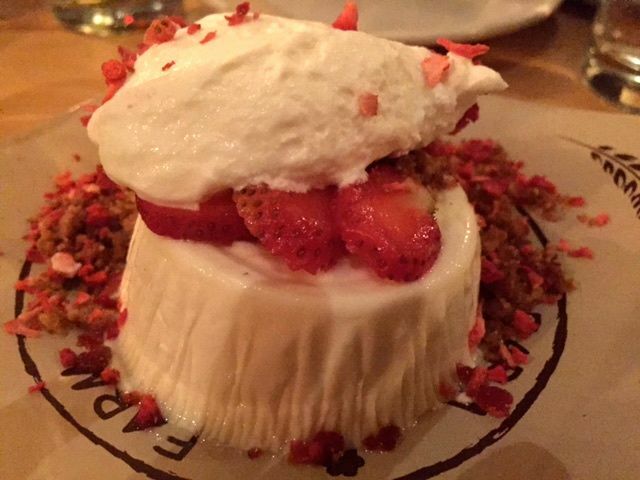 In spite of its rich ingredients, it turned out to be quite light and the Panacotta Shortcake was a cloud of fluffy deliciousness topped with fresh strawberries and a good sprinkle of crunchy biscuit crumbs. 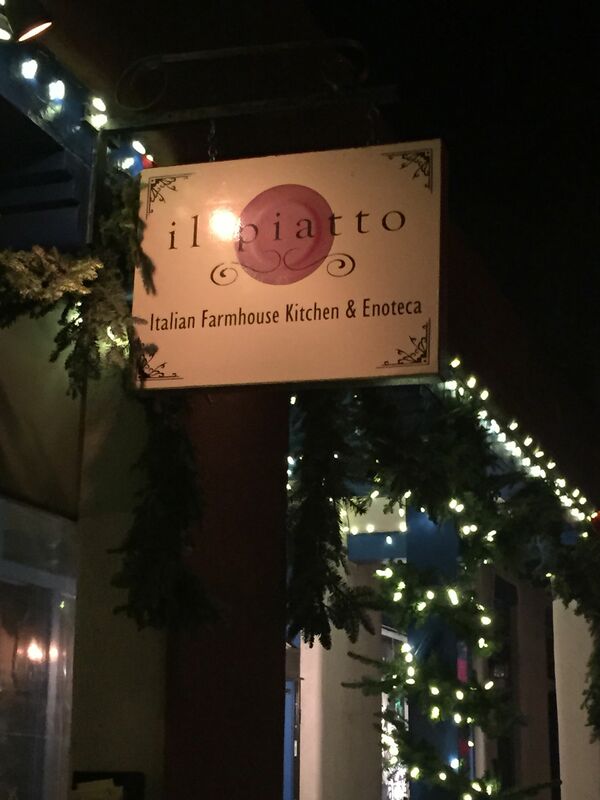 Ok, I know you’re probably wondering what on earth is she doing blogging about an Italian restaurant in a town like Santa Fe. Well, you would be as surprised as I was when I found some interesting dishes at this charming eatery where Italian and New Mexican cuisine are married and rather happily! This is not just any restaurant, it’s a farm to table one. Food comes from organic farms to ensure the freshest and most wholesome experience, a dining luxury at a very reasonable price…a true gem in the Santa Fe dining scene. The atmosphere was perfect, low lighting and tables busy with happy patrons who filled the quaint dining room with lively chatter. 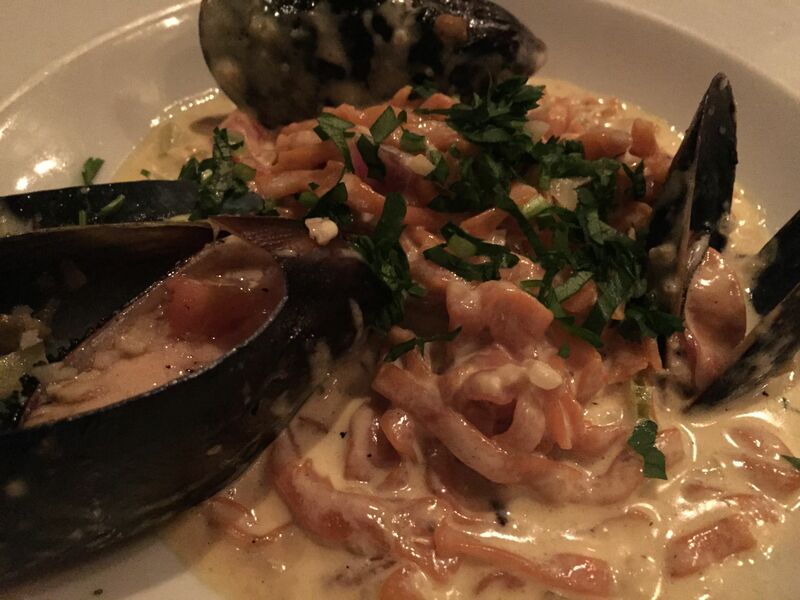 Lovely waitress Zina was eager to recommend some very tempting choices but I must say that the star on the menu was the homemade red chile linguine with Prince Edward Island mussels in a light yet velvety saffron cream sauce for $13.79….unbelievable! Spicy and creamy, plump meaty musles and perfectly cooked spicy pasta…what else do you want? Of course, a nice bottle of Domaine Brunel Côte du Rhône 2011 for $35! 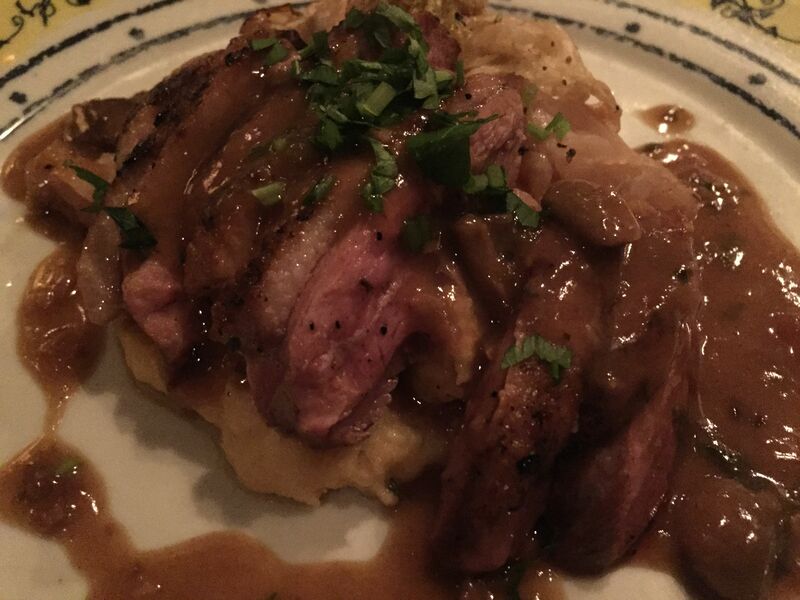 Also, on this creative menu was the grilled duck breast with mushrooms, marsala and creamy polenta for $27.79… pricey? Yes, maybe! 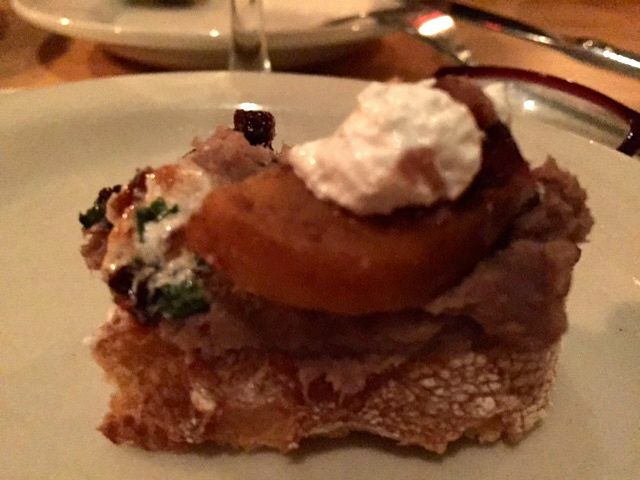 But well worth it, it is duck after all. Also delicious was the spicy homemade Keyser pork meatballs and spaghetti for $12.79. 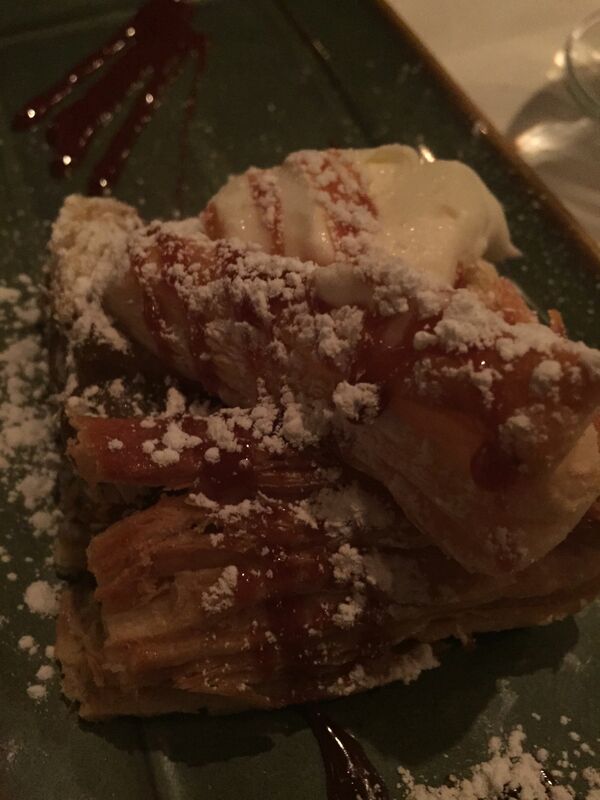 For desert, the Anjou pear over phyllo dough drizzled with caramel and fresh whipped cream was the perfect way to end our New Mexican-Italian meal! New Mexican Italian, what a concept! 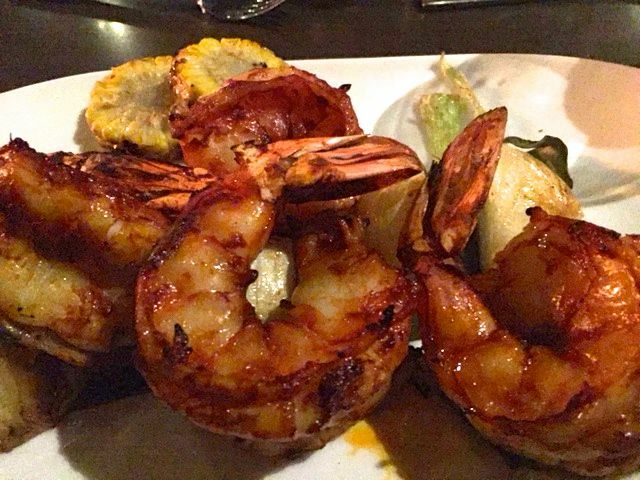 *You have the option of ordering appetizer or entree portions on some of the menu items.